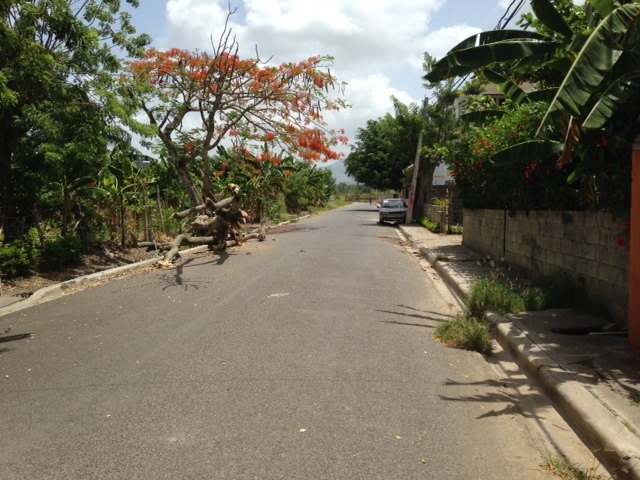 A view as we were walking at the end of one of the streets in Santiago, Dominican Republic. I love church. It has been a part of my life since before I can even remember. I remember standing in front the church as I was baptized, along with my sister, at Friendship Presbyterian Church in Hickory Tavern, S.C.
I’ve been a part of the United Methodist Church for more than 20 years. Over the past eight years, I’ve been a youth volunteer, youth minister, pastor, associate pastor and then pastor again. But sometimes, I think about a quote from Francis Chan’s book, “Crazy Love.” He talks about how the church likes to plan and sometimes we plan to the point of what we will do if the Holy Spirit shows up. Sometimes, we just don’t know how to handle it when the Holy Spirit shows up and wrecks us. Maybe the same thing can be true in our lives too. That’s probably what hit me the hardest during my time in the Dominican Republic. There was no “cellular data,” no internet to fall back on. I wasn’t receiving e-mails all the time. There was no Facebook or any other kind of data. In fact, in the time there, I made just a couple of calls to talk to my wife and daughter. For the most part, I was there in the moment. No schedules, nothing else going on. It was just a chance to experience God in the moment. One of those moments came on the second day of our walk through the community in Santiago. A small group of our “missionaries” went out that morning with Awilda Rosario, wife of the pastor of the church we were working with. Awilda knew that area and she knew people there. We simply started to walk from home to home. We invited children to the Vacation Bible School and then we found ourselves in a home. In the first home, the husband and wife pulled chairs from all over the house so that we could sit and talk with the husband in their garage. The wife offered us water and I had a glass and thanked them for their hospitality. The husband talked to us about the Bible about what it meant to him. It was a great visit and we thanked them before we moved on. As we walked down the street, Awilda stopped to talk to a man that we encountered there. She had a long conversation with him in Spanish. As he walked away, she apologized to us for not translating. She said, though, that she saw that man walking on the street many times but had felt in that moment that she just needed to talk to him and encourage him. Maybe that was the beginning of the Holy Spirit’s message for that day. We made several other stops, but we ended up in a home with a mother, a son and the man’s nieces and nephews. Through Awilda, the son told us of how he had spent so much of his life on the street, battling addiction issues. However, he had found the strength in God to battle through those addictions. He was still alive today because of God’s love. His mother told us that she should have been dead a few years before that. But she had miraculously pulled through. She also gave the credit for what had happened to God. It was an incredible and inspiring conversation. Awilda asked for someone to pray and that ended up being me. I remember thanking God for the chance to be in this home, for the blessing of this time and this conversation. I prayed for them, for all of their family. It was a moving moment for me and one in which I knew I was not alone in the prayer. God’s presence was with us. That feeling would continue at the next home we visited. I decided that this would be my time to talk to the family. My conversation was with a young man named Brian. Awilda was serving as our interpreter and I talked to Brian about the VBS and how the children were invited to come and to be a part. But as I was talking to Brian, I felt very distracted by the older woman to the left. Her name was Matilda and she seemed to be very unhappy as she washed out the plastic milk jugs in the sink. Matilda said something to Awilda in Spanish and they began a conversation. All I can feel at that moment was this sense that I needed to pray for Matilda, that I had to pray for Matilda. I told Awilda that I wanted to pray for Matilda and Awilda said she wants you to pray for her. As I begin to pray, the word “hope” kept coming to my mind. I prayed for Brian, Matilda and their family, and I prayed for hope as Alwida translated each line of my prayer into Spanish for the family to hear. I remember after that seeing the tears in Awilda’s eyes as she told me what Matilda had told her. Matilda said that she had no hope and that she was just waiting for Jesus to take her out of this life. When I prayed for hope, the one word that kept coming to my mind, I was praying for the one thing she was looking for in her life. That day became a day in which I was wrecked by the Holy Spirit. The Holy Spirit opened a door that I might never have seen or known otherwise. I knew that as I walked away that day that something bigger was at work in me. After spending months dealing with illness and then surgery, I knew that I had felt battered mentally, emotionally, physically and spiritually. I was already mending physically and getting there mentally. But that day was the opening of a door to the healing of my heart, my emotional and spiritual center. And that will be the theme of the next two parts of this journey. 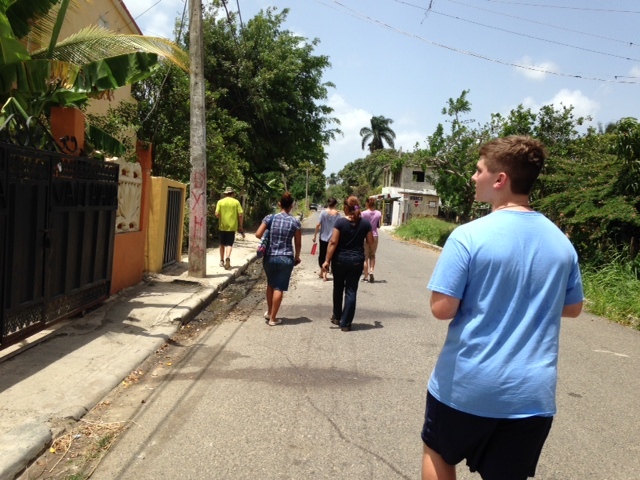 Our group walks down the street in Santiago to invite people to attend VBS. One of the things that this mission trip to the Dominican Republic offered was a chance to do something I really haven’t had the chance to do before. I’m talking about making contact with people you’ve never met before and inviting them to be a part of what you’re doing in faith. I’ve done some personal evangelism before, but it wasn’t a big part of what I had to do in seminary. So, this was a chance to really “go and make” as the Great Commission directs us to do. Then, we went to Congregacion Cristiana Rey Eterno, the church we working with, and we headed out in small groups to meet the community. At least on the first day, we had a mission. We were to introduce ourselves, meet those living in the houses on our assigned streets and we were to invite them to bring their children to Vacation Bible School. We were helping to put on the VBS for the church. It was interesting as the “adult” in the group (aside from Awilda, our interpreter) to listen as the younger people would decide who would speak at each house. It was also amazing to see the ways they would step up, ask questions and invite others to VBS. The streets we were on in Santiago were an interesting mix of all styles of homes. Some stood behind elaborate metal fences and gates. Some open spaces were filled with banana trees. The neighborhood was peppered with small businesses. We entered into a store, passed by several people selling bananas, plantains and mangos, and we saw people pushing carts of items for sale down the street. From time to time, cars would pass us on the street and motorcycles would zip in and around the obstacles on the road. In this backdrop, we begin the task of invitation. I don’t remember a home in which the people there didn’t welcome us. Awilda served as our translator and, when it was our turn to speak, we would speak through her. There are things that seem to work across cultures when it comes to this type of sharing. We have to open ourselves up to talk to the person we are meeting. We need to be interested in their lives and what we are experiencing. We share those places in our live and our journey that give us a common experience. We shared information on the church and how the children could come and be a part of VBS. I loved listening to the conversations that we would have. Maybe it’s because they seemed so warm and friendly. It’s so possible to come across as cold, almost as if you are leading an interrogation, in the way that you ask the questions. Maybe on that first day, we went to 15-20 homes. When the VBS began that day, I saw many of the people we had talked to bringing their children to participate in the VBS. It makes me wonder, sometimes, why we can’t do more things like that in our own community? Is it because the rejection is easier when you are that far away from home? Or is it something else. I’m still struggling through that question. Yet, I know that I saw the power that day of talking to people, sharing faith and inviting. Maybe that’s the day that I was able to see the Great Commission in a whole new light. This is the second part of a series of blogs related to our mission trip to the Dominican Republic. As I write these, I’m trying to process the amazing things I experienced as a part of this adventure for God. One of the things that I’ve found, for me, in worship: There’s a big difference between leading worship and worshipping. Here’s what that means for me: In a worship service, I’m often doing such things as facilitating what happens, keeping an eye on the clock and making sure that the moving pieces are moving. That makes it difficult, sometimes, to simply let go of everything and connect to God through worship. Maybe that’s why what happened at 10:30 in the morning at the Congregacion Cristiana Rey Eterno (translates to Eternal King Congregation) was an important moment for me. I was there simply to worship. There are all kinds of excuses I hear (and I can give) about why I can’t worship. Excuses can range from things about preference (music, sermon style, type of worship) to environmental issues (too dark, too loud, too bright, too cold). So, here we were, our group of 30 “missionaries” and we find ourselves sitting in a church in Santiago. It’s not like the church that most of us come from. The church building has a roof and open walls. It sits next to a volleyball and basketball court and two sets of bleachers. We sit in plastic chairs lined up to point to the front of the space. There is a podium, a drum, a keyboard and a couple of speakers so we can hear the music. There’s no air conditioning to turn up and down. There are no lights to set and turn toward the stage. In fact, there’s no raised stage at all. As we sit there before the service begins we hear the sound of the barking dog walking across the athletic court and the sounds of the rosters crowing at the house beyond that. I don’t have a hymnbook in my hands and there are no words on the screen. Yet, something amazing would happen in that worship time. The service opened with a translator helping us to understand the Spanish. But as the music begins, the interpreter’s job ends. Awilda Rosario, the wife of the pastor and one the leaders in the church, joins with the others who are leading us in song. The music is powerful, moving and Spirit-filled. I am only able to pick out a few words that I understand in Spanish, but I know that they, and the others there, are singing their hearts out to God. It stirs something in me in a connection to God. In that day, I saw a group of people who passionately loved Jesus. And that love of Jesus was able to powerfully break through all of the barriers that might have been in the room that day. Seeing their love and their passion for Christ was like a dose of spiritual vitamins into my own love of Christ. The love of Jesus transcends the limits of language. The love of Jesus cuts through the fatigue that we might have experienced in getting to the Dominican Republic. The love of Jesus reminded me that my family was much bigger than I could have ever imagined it would be. There were powerful moments in the service. Then, we had the chance to connect through the Table. A speaker, in Spanish, related to us the events of what happened at the Last Supper. Then, we were invited to come to the front to receive the communion elements. We sat back down and held them in our hands as we were invited to share in the breaking of the bread and drinking from the cup. Once again, my eyes were opened to the power of God to reach across all of the barriers that we might otherwise construct. One of the leaders from our group of missionaries shared the message that day. At the end of the service, Steven and I, along with the other adult leaders, were invited to stand in front of the church. They prayed for us and for what we would be doing. They asked for God’s blessing to be upon us. They welcomed us with open arms. I felt overwhelmed. Maybe that’s what comes when we feel as if we are truly pouring ourselves out in worship. I felt it physically, mentally and spiritually. I felt lifted up. There’s something about a strong spiritual moment with Jesus. It recharges you and it pierces us to the heart. I felt that way on that Sunday. I knew in that moment that my mission for the week would be this church we were attending. I know that I’ve been blessed in many ways and it gives me the opportunity to be a blessing to others. Somehow, I just knew that this church was going to play a key role in my mission work for the next week. Worship is bigger than any barrier we can create. Worship is more powerful than the words that are being spoken or the lyrics that we are singing in the songs. Worship connects people across the globe. Worship is rooted in the powerful reminder of grace and mercy that come through Holy Communion. And most of all, God reminded me of just how much I need and long for the chance to connect to the Holy Spirit through worship. It was nothing short of a life-changing moment. 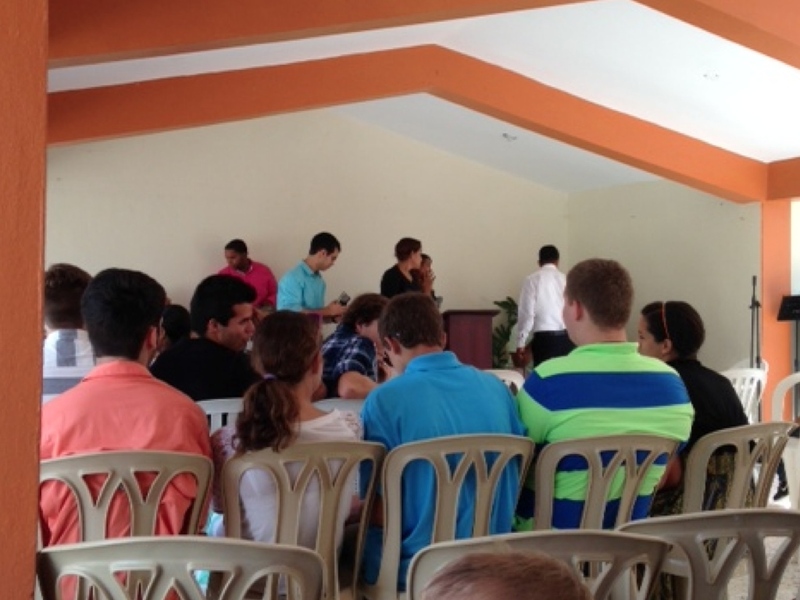 This is the first in a series of blogs related to a mission trip to the Dominican Republic. It will be my way of sharing as I try to make sense of the many things that happened during this time. I believe that there are things that just happen in life. There’s a series of connected decisions and moments that lead to events that can interrupt our lives. But despite those events, we have a promise. God can take all of the events that happen in our lives and God can redeem them for a higher purpose. The series of events started on the Thursday that we were to leave for the Dominican Republic. There’s a hurricane spinning off the East Coast. Flights out of Atlanta are starting to get delayed. 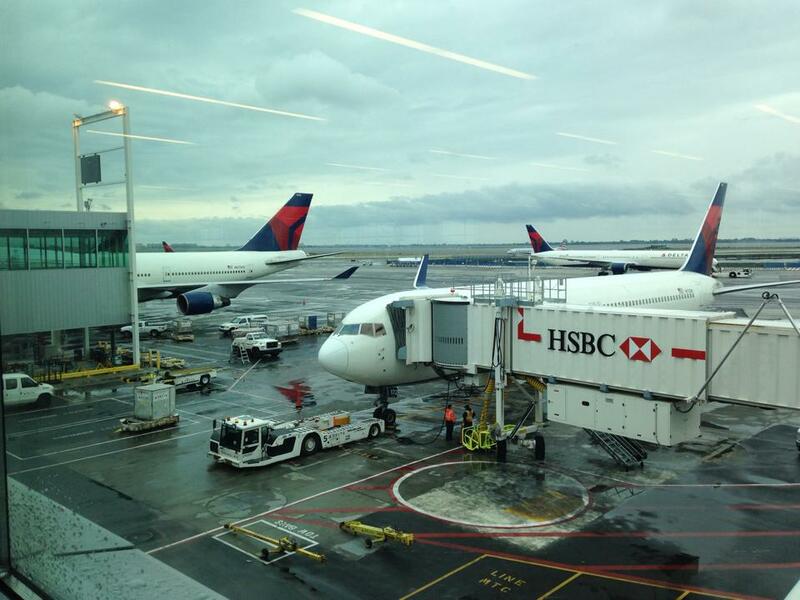 Flights out of New York are starting to get delayed and canceled. We arrive at the Columbia Airport in the middle of this and prepare to board the plane for the first leg of the journey that will take us to the Dominican Republic. We hit a snag that leads to us going home for the day and coming back at 5 AM the next morning. We try again and we make it from Columbia to Atlanta and then to New York. Then, we hit the snag again. Because of all the delays the cancelled flight, our flight from New York to Santiago is massively overbooked. In our party of 10, only four have seats on the plane that is boarding to head out. Others who are in the same predicament stand around the counter. It’s easy to become angry and frustrated and to wonder why God would let something like that happen. I was angry and frustrated and so was everyone else who was standing there hoping to get onboard the plane. We were standing there with a group of teens heading to a mission trip and we couldn’t split our group up and send four now and six later. It was all or nothing for us. The only option was to come back on Saturday and to make the flight to the Dominican Republic. So the four of us with tickets gave up our seats on the plane. It felt like for a moment that I was handing over my hope. I didn’t like this. We had been led to believe as early as Columbia that morning that we would have no problems making this flight. So, here’s when God steps in and the redeeming begins. When I handed over my ticket, it went to a man who was trying to get home to see his young daughter. (As a father with a daughter, this one tugs at me). When the Delta employee handed him the boarding pass, he said, “Thank you, thank you, thank you,” as the tears streamed from his eyes. Another of our tickets went to a mother whose young son was already sitting on the plane in a seat. It allowed a family to travel together and to make it home. I was still frustrated in that moment. Maybe we all were. It’s no fun to send text messages to those back home that we are going to be spending the night in New York. But, here we were, in New York, on the Fourth of July. Delta gave us a hotel room to stay in and we were still dealing with the baggage issue. But a quick check found that eight of the 10 in our group had never been to New York before. We rode the Air Train and the the Subway to Times Square. We had a chance to see massive firework displays going off all over the city. Some of our group stood with their mouths open at the overwhelming site of Times Square. Some of us ate hot dogs from a street vendor. I don’t know really where I was when we started to leave on Thursday. I had other things on my mind and issues swirling around. Over the course of those three days of interruptions, I was able to turn my mind away from those things to start to prepare myself for what happens next. Maybe it was because of all that we went through that I arrived in the Dominican Republic with a new heart and a new mind. I was appreciative to be there. I was ready to begin this work that God had brought us too. I was more open to God as God spoke through the people we met and the worship service that we attended. That journey there could have put a blemish on the entire trip. Instead, by opening myself up to the new possibilities that the interruption offered, I was able to see things in a new way. God truly can take events and circumstances, tough moments, challenging moments even interruptions, and redeem them for His Higher Purpose.